A small but moving episode marked the regular annual meeting of the German organization Fighters and Friends of the Spanish Republic 1936-1939 (Kämpfer und Freunde der Spanischen Republik 1936-1939). It was the first such meeting without a single veteran; the last volunteer in Germany, Fritz Teppich, died last winter, and none of the tiny, decreasing number of survivors from other countries was able to attend. But there were friends, often children of the veterans, from other countries: Italy, Sweden, Russia, France, the Netherlands, Northern Ireland. And of course Spain was represented. Aside from lectures and discussion on strengthening international ties so as to keep the spirit of Republican Spain alive, even without the vets, the participants paid a visit to the site of the Nazi concentration camp in Sachsenhausen, an hour’s drive from Berlin, with special attention to the Spanish and International Brigade fighters who were imprisoned there (including the Republican premier Largo Caballero). The episode mentioned above featured two children of International Brigade fighters. 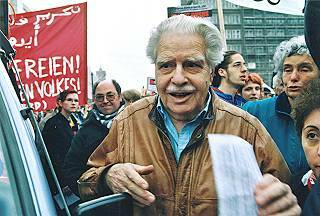 Otto Kühne, a German Communist, was arrested by the Nazis on the night of the Reichstag Fire on February 28th 1933. But he was soon able to escape Germany and led the exile German anti-Nazi movement in Norway until the war began in Spain, where he fought from May 1937, becoming commissar in the 11th Brigade with its famous Thälmann Battalion). In December 1938 he escaped to France but was soon caught and, like most of the fighters in Spain from fascist homelands, interned in French concentration camps. But in 1940 he was again able to escape and formed, with other German anti-fascists, a unit of the French Résistance. Before long he commanded a unit with 2700 French, German, Spanish and other fighters, battling the Nazi occupiers in the Cevennes Mountain region. In 1943 he was promoted to the rank of lieutenant colonel. During the years of battle, which finally resulted in the liberation of this entire area, he was faced at least once by a difficult decision. A small group had to go on a dangerous scouting mission. Otto Kühne, as commander, asked for volunteers. One of them, a young Frenchman, spoke to him before leaving and gave him a personal ring. Return it to me if I return safely, he requested. If I don’t, you may keep it for yourself. The young man did not return. And Kühne always wore the ring. He survived the war, returned to East Germany and held leadership jobs in the German Democratic Republic; he was mayor of the city of Brandenburg for a number of years. Before his death he requested that the ring be passed on to other veterans of his unit. It was, to Karl Gaile, and after his death to Heinz Priess. But when he died – over ten years ago – the ring could not be found and was gradually given up as lost. But then this year Priess’ son found it and gave it to the daughter of Otto Kühne, Eveline Lüders. Despite a life marked by very difficult years – with her mother and baby in distant Kazakhstan, barely surviving hunger and deprivation – Eveline, though past 90, is still an active, indeed a lively, member of the Spanish organization in Berlin. And she decided to maintain the tradition. At the Saturday evening session of the conference, during a wonderful music program, “Evi” ceremoniously gave the ring to Herbert Mosch, the son of one of the men who fought – and died – in her father’s unit of the Maquis. Mosch, past 80 himself, from a town in southeastern Germany, often tells how he and his family – after 1990 when such trips became possible – drove to the mountain village where his father and other German comrades are buried – with a commemorative stone to mark the site. They knew no French, and found at first a degree of reservation towards what seemed only somewhat unusual German tourists. But as soon as they found an interpreter, and the people of the town village learned whose son Mosch was, they were given an overwhelming welcome and became lasting friends with people there, whom they now visited as often as possible. Herbert Mosch, also an active member of the organization, will always wear the ring, and will then pass it on to someone who also wants to keep good traditions alive; the internationalist struggle against fascism in Spain and then, as in the French Résistance, again joining to fight the Nazis, still a lurking menace, in both France and Germany. The French participants in the congress promised to pass on a request; since the ring has two carved initials, it may still be possible to discover the name of the young fighter who once owned it – and find out if any of his relatives are still alive. If Victor Grossman sees this, please can he e-mail me. I am researching the story of Otto Kuehne and his comrades in the Cevennes in WW2.